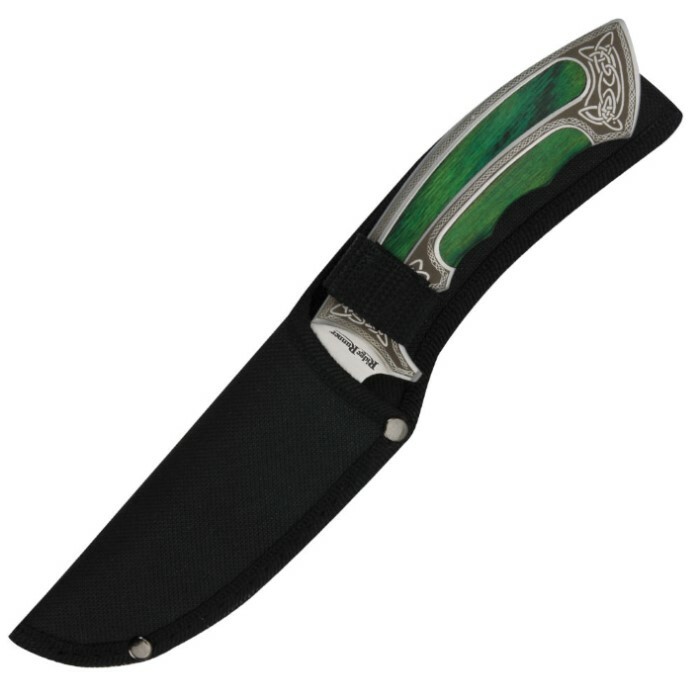 Ridge Runner Celtic Elite Bowie | BUDK.com - Knives & Swords At The Lowest Prices! 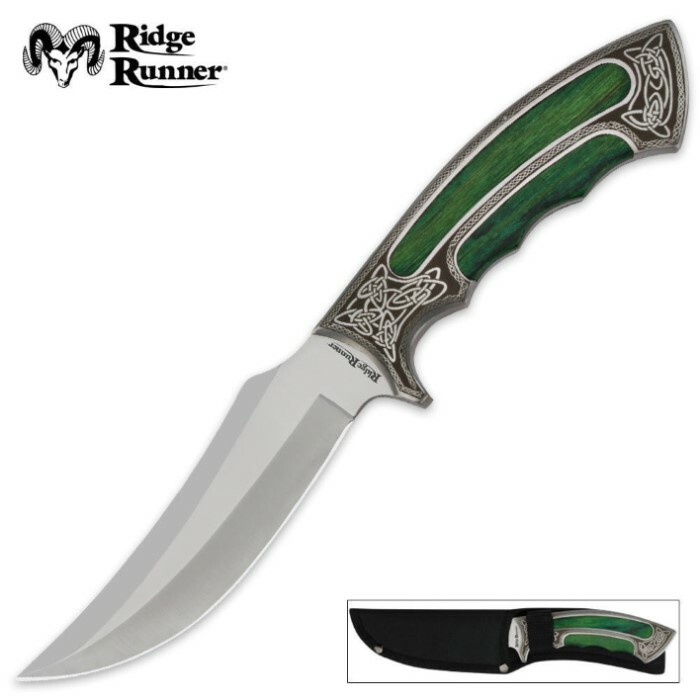 Commemorate your Celtic heritage and pride with this Celtic Elite Bowie, only from Ridge Runner. This bowie offers quality stainless steel construction and green wood inserts, accented by Celtic knot and scrollwork designs laser-etched into the stainless steel pommel and guard. 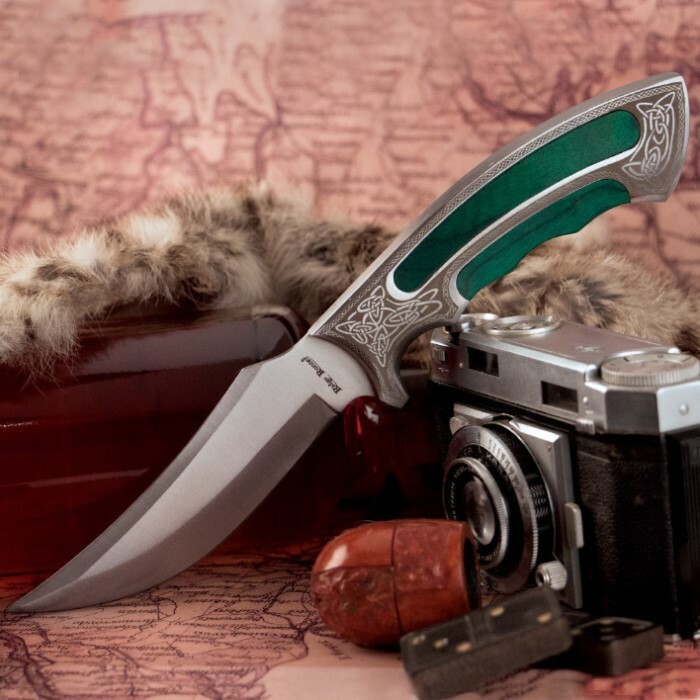 A truly handsome knife any Celtic gentleman! If you intend on wearing this, you'll need to upgrade the "custom" sheath, as this ones strap sits too low allowing the knife to flop forward due to its heavy handle. It really is full tang so it feels powerful, the green wood is very eye catching. I collect alot of blades mostly combat but I got this one specifically cause it was pretty to me. It not only looks great but in my opinion it seats well in my hand and even though I got it to be a "dress knife" (weddings, funerals, graduation, whatever the occasion) it is fully capable to be a combat/self-defense knife as well. My girl even likes this knife cause on top of everything I mentioned above it also matches her eyes. Cool thing was that I got this as a bogo so she got one too. Thank you BudK. This knife is a beautifully crafted piece. I love having it in my collection. The blade is good quality and very sharp. Not only is the knife great, but the price too. At $9.99 it's a bargain! Go out and get yourself one!!! such a nice looking, and very functional knife. I love the celtic knots, and the green handle really catched the eye as well. Well constructed full tang like its brother the executive. Have my eyes on the big daddy the ambassador. Thanks again Kennesaw! Great knife I have some Irish ancestryand it makes me proud to be able to display that ancestry when I wear it. Only draw back is the dye/paint on the handle is starting to rub off. Other than that I am very happy with this knife. Got the knife cause of it's appearance but wasn't expecting something of quality. It's a pretty solid knife at a fantastic price only reason it got a 4 from me because it could be sharper and I hate the sheath it comes with. This is likely the best knife in my collection. Not only is it nice to look at, but it appears to have been made with special care! I think this knife Is an Awesome addition to my collection!! !